Warning - Please read this section first ! Please remember that water and electricity DO NOT MIX. If you are not capable of performing a repair yourself, please contact a local spa professional or a licensed electrician in your area. Also realize that the wiring and equipment described herein represents the "average" spa equipment pack. Your unit may vary significantly from the components described below. If you are in doubt as to how to properly troubleshoot or repair your specific unit, please contact a local spa professional or a licensed electrician in your area. Use any of the information contained herein AT YOUR OWN RISK. We will not be held liable for any injuries that may result from the troubleshooting or installation of any electrical components in your hot tub spa unit. Are the ball valves open? Is the water level correct? Is the filter cartridge dirty? (remove if in doubt) Are the jets wide open? Is the impeller clogged? Is the system primed? Are the fillings tight? Are the 0-rings in place? Is the bib fitting tight? Is the thermostat set properly? Is the Hi Limit switch tripped? (If so, why?) Are the heater wires burnt? Are the contactor wires burnt? Is there proper voltage to the pack? Is the timer in control (if so, was pack run long enough?) Are all wires in place? Is there power to the heater? (Indicator light would be on.) Is the pack in the proper mode for heater operation? Does the heater work on high speed? With a 110 volt pack, was the pack run on low speed only? A 110 volt pack will only heat on low speed at a rate of 2 to 3 degrees per hour. See also Total Lack of Heat section below. Check each of the things under Low Speed Pump Does Not Function except the last one about timer operation. Is the hi limit switch tripped? (See section Pump Will Not Go From Low To High Speed.) Is the impeller spinning inside the pump? Is the GFCI reset? Does the air switch work? If the GFCI trips, is there water in the blower or blower lines? Is the top of the air loop mounted higher than the water level, as it should be? Also see Air Blower Does Not Work at All section below. This section applies only to the total lack of heat, not to the lack of enough heat rise. First, make sure the pack is in the mode of operation such that it should be heating. (Low speed pump only is standard.) After each check, if a correction is made, check heater for amp draw to verify problem or corrected problem. Make sure valves are open and water level is high enough in spa. If #1 and #2 check OK and your water flow is still weak with air bubbles coming through (the air induction being closed) check for loose pipe connections at all joints. (A slow drip may result when the pack is turned off at such a loose joint.) Also, be sure all jets are open for maximum water flow. REMOVE PACK COVER. Using volt meter on a minimum 240 volt scale (120 on a 120 pack) check to see whether the power coming in is enough to power the pack: 210-240 on 240v, 110-120 on 120v. If not, have an electrician look into it. If heater relay does not activate, check for proper voltage at the point where the black or red wire meets the relay coil. (Your specific wiring diagram should identify the coil voltage.) Also verify that the right relay is in the unit by checking the ratings against the diagram. If voltage is not found at the relay coil, check flow switch/pressure switch as described in #8. If flow is OK, check thermostat for power out. The wire leading to the flow switch from the thermostat should be carrying 120v. When checking for this voltage, disconnect the wire from the pressure switch so you do not get test interference from voltage that might be coming from the other side of the heater relay coil. Be sure the thermostat is turned all the way to "Hi" before looking for voltage. Also, make sure the thermostat sensing bulb is located properly to sense the water temperature. If the bulb is exposed to air, COVER IT. If out of the well, insert and center it. If no voltage is found, adjust calibration on the thermostat by turning Allen screw at top of switch clockwise until a "click" is heard or you reach 1/4 revolution (whichever comes first). If you turn it around 1/4 way without hearing the click, your thermostat must be replaced. 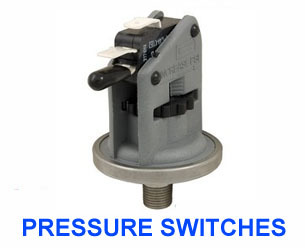 If you have a pressure switch, adjust it as described in Pressure Switch section below. Heaters are considered Flo-Thru type heaters because the water flows through unrestricted by elbows or thermowells. Most are 6kw and are rated for 240 volts. Some have the elements welded directly to the manifolds such that if the element wears out, you replace the entire heater assembly. Some elements can be removed for replacement but are more fragile. If you go to replace an element, be sure to hold the base of the post with a 1/4" open-end wrench to prevent twisting of the post. Otherwise you stand a good chance of breaking off the post. Be sure to hold it tight again when reinstalling the wires on the new element. To determine if the element in a flo-thru is bad, test it the same as you would a regular element. If the wires have been removed, check it for continuity. You should see approx. 9-11 ohms of resistance if it is good, maximum resistance if bad. Be sure to measure resistance between a post and your ground to make sure the element is not ruptured. You should see maximum (infinite) resistance if it is good. If the needle moves at all on the meter, you have a rupture in the element sheath. You would need to replace it. The continuity test to ground is best done when the manifold is full of water. The hi limit and thermostat bulbs are usually positioned under a protective metal insulated cap secured to the manifold by a wing nut. Make sure the sensors are fully under the cap and that the cap is tightly secured. If insulated properly you should not be able to see the side of either bulb under the cap once the nut is tight. If you can see it, ambient air can get to it and affect the temperature control performance. If you are sure the bulbs are straight in the grooves on the manifold, and that the cap is tight, you could add some insulating tape or something to help block ambient air from that area of the heater for more consistent performance. Grounding of the heater is achieved through the use of nuts with external tooth lock washers securing the manifold to the control box. Be sure to reuse the same nuts if you remove them. The lock washer breaks through the protective coating in the box to establish ground. Be sure GFCI is reset and working. If not working, replace it. If GFCI cannot be reset, you probably have water in the blower or GFCI receptacle. These must be totally dried out. Try using a hair dryer on these components. If water is found in the blower line, it may take several hours to dry out. If water is not the problem, check for improper wiring, and if this is not the case. Check for power where the black wire from the blower meets the air switch. 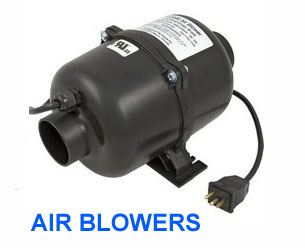 If power is found, the blower may be bad. Replace. (Be sure your neutral wire is hooked up and that you do not have an open neutral condition on the GFCI before replacing the blower.) If power is not found, the air switch may be bad. Check the wire powering the air switch and check the switch for continuity. If no power, check the wire leading to the switch for continuity and replace as needed. If you have power but do not get proper switching action, replace the switch. If none of these things fix the problem, the blower may need to be replaced. Be sure thermostat is turned all the way up and that the equipment area is well ventilated. Hi ambient temperatures around the pack will effect thermostat calibration. Also make sure the thermobulb is properly located and protected to sense water temperature. Slowly turn the thermostat from "Hi back toward "Low. See if you hear a click. If a small click is not heard, the thermostat may be set too low. To adjust, insert a properly sized alien wrench into adjustment screw found just below the shiny silver plate on top side of the thermostat. Turn the screw clockwise to raise the setting. One quarter revolution is equal to a rise of 100. If you have to turn the screw more than 1/4 revolution to achieve the desired effect, replace the thermostat. If the "click" is still not heard, replace the thermostat. 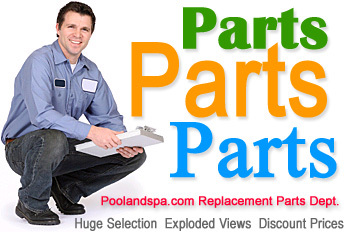 If replacing the thermostat does not correct the problem, call a spa professional. 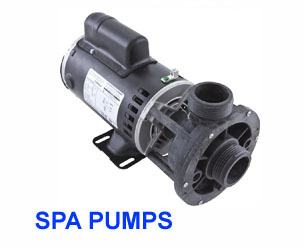 The equipment may be equipped with a special safety circuit that activates when the pump is left running on high speed for extended periods of time. This would cause the water in the spa to reach temperatures high enough to cause the hi limit switch to trip, disengaging high speed operation (as well as the heater.) If this is the case, when the air switch is in the position intended for high speed operation, the low speed pump will not shut off with the timer operation (turning the bypass). When the air switch is in the position intended for low speed operation, the timer will be able to shut the low speed pump off. If this accurately describes the present operation of the equipment, reset the hi limit switch, make sure the high speed pump now works. If the hi limit switch is not the problem, follow the instructions below. If wiring inside is OK, check for loose wires at rear of pump. Correct if necessary as described in #2. If wiring inside is OK, the air switch may be faulty. Using your volt meter check to see that power is alternated from your high to low pump wires when the air switch actuator button is pressed. (Usually, black for low and red for high.) Be sure that the air hose is not pinched between the button and the air switch, and that there is no water in it. If the air switch does not work, remove actuator button and blow into the line as the button may be bad. If power does not transfer from Hi to Low, replace the air switch and try again. If power does transfer but the pump does not respond, check for power at the pump and if it is there, replace the pump. If it is not, replace the cord to the pump. HINT: Make sure common wire is hooked up before replacing pump or cord. If power is found at the rear of the pump but the pump does not respond, replace the pump. Check wire (Black) leading from air switch to the pump for 120 volts, if voltage is not there, replace the air switch. If power is there, check the back of the pump (the Black wire) and see if you have 110Ov. If not, replace the cord. If you have 120v and your common wire is hooked up, replace the pump. Be sure you have power to the pump from the timer. If not, check to see that the bypass is not activated. If the bypass is not on and power is not coming through, replace the timer. If power is coming through timer, check the Black wire at the back of the pump for power. If it is not there, replace the cord. If it is there, replace the pump. Check your common wire on the pump to be sure it is hooked up before removing pump for not operating. Once you are sure the motor requirements match the wiring method, check for proper voltage at the air switch where the pump wires attach to it using the method described under VOLTAGE TESTING. If proper voltage is not found, check the wire that powers the air switch for voltage. If proper voltage is found where the wire feeds the air switch, and not where the pump wires attach, replace the air switch. (A continuity check of the air switch function will verify this problem area.) If power is found at the pump wires, check the back of the pump for voltage. If none is found, replace the cord. If proper voltage is found, replace the pump. Thermostat out of calibration: Recalibrate as described under Heat Works, But Tub Does Not Reach 104 Degrees, only in this case turn the calibration screw counterclockwise to reduce the temperature setting. Thermostat sensing bulb not applied: Make sure the sensing bulb is applied to the manifold under the heat tape (older models) or inside a thermowell if provided. If in a thermowell, make sure the bulb is centered in the well. Heater relay contacts may be stuck closed: Replace relay and determine cause (could be chattering thermostat, low voltage, bad pressure switch, or pump cavitation). If contacts are damaged, install a suppressor on new relay coil. Hi speed pump may have been run for too long: If water exceeds 122 degrees and equipment includes new hi speed shutdown relay, check circuit and hi limit operation. Hi limit may be defective: If water exceeds 122 degrees and includes the hi speed shut down circuit, the hi limit probably needs to be replaced. If it does not include the new circuit, see if the hi limit is tripped. If the limit is not tripped, it is out of calibration and must be replaced. NEVER RECALIBRATE A HI LIMIT SWITCH. The timer only controls the low speed pump - NOT THE HIGH SPEED. When the pack leaves the factory, the timer switch controlling the low speed is open such that the low speed pump will not come on. All trippers are in the OFF mode so the low speed will not come on unless the bypass is used or the trippers are pulled and lined up with the arrow on the dial. The only way the low speed pump should come on without the use of the timer (if the pack is fresh out of the box) is if the installer happens to push the air switch and instead of high speed they get low speed. This can happen if during shipment the equipment is stored in a room or truck that gets very hot inside, in which case the hi limit will trip and engage the hi speed shut down circuit (see Hi Speed Pump Does Not Function). Usually, each tripper on the timer is good for only 30 minutes of low speed operation, however this will vary from unit to unit (some are good for 15 minutes). If continuous low speed operation is desired, all trippers must be pulled to the ON position. The bypass (if you have one) will only affect operation until a tripper set in a position that will nullify the effect of the bypass function comes in front of the arrow. That is, if the tripper in front of the arrow is pushed in, and the next several trippers are also pushed in, turning the bypass to have the low speed pump come on will only be effective until the next consecutive tripper pushed in comes in front of the arrow, or a maximum of 30 minutes. If you wish to have the low speed remain on, you must either turn the bypass again when it shuts off, or pull the next several trippers to their "ON" position for as many minutes as you desire the pump to run. The opposite is true for the use of the bypass in conjunction with trippers pulled out in the "ON" position. The bypass would only keep the low speed pump off until the next pulled out "ON tripper lines up with the arrow. The clock on the timer is rarely going to be bad. If it loses time, consider whether there may have been a power outage or if someone is welding nearby. A neighbors welding can affect your timers ability to keep time. The arcing has an affect on the cycles (usually 60Hz) and can change them. If it gains time, someone could be changing the dial position on the timer. Simple adjustment of the tripper positions can inadvertently affect the timer dial setting whether you are aware of it or not. If a time clock is legitimately not keeping good time, it should consistently need the same time adjustment every 24 hours. Monitor its performance untouched for a period of several days. If you truly have a bad clock, consistent time loss or gain will be evident. Replace timer. A pressure switch will allow power to pass through it as long as there is a measurable amount of pressure in the cavity to which it is connected. This pressure can be created whenever the pump is running and as long as there is some water in the bottom of the pump housing whether the rest of the pack is full of water or not. That is, as long as the valves are shut creating a sealed cavity in order to build pressure. Therefore, when the valves are open, the heater will not come on when there is not enough water in the plumbing to maintain pressure. To check calibration, see if the black toothed gear on the back of the pressure switch is turned as far counter-clockwise as it can be. With the pump running it should turn the heater on. If it does, turn in clockwise now until the heater shuts back off and re-loosen it one-and-one-half turns. If it does not turn the heater on, replace it. On the other hand, if you cannot get the heater to shut off while the valves are open and the pump is running "dry", then the switch is either broken or frozen shut and must be replaced, or the contacts of the heater relay are welded closed. To replace it, first shut off the power and then remove the two wires going to it. If you have service valves to the equipment pack, shut them off. If not, and the pressure switch is of the type that has a barbed fitting and a hose connecting it to the heater, have the new switch close by and proceed as directed in the next paragraph. If you havent any valves and the switch screws directly into the heater manifold, you will have to drain the spa in order to change the switch. If your switch is connected to the manifold with flexible tubing, pull the tubing off of the switch and cap, plug, or clamp off the tubing to prevent water spillage. 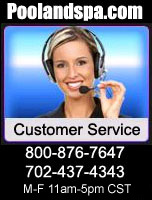 (If you have service valves to shut off, you wont need to worry about this.) Then remove the retaining nut holding the switch in place on the control box. Remove the switch from the control box, install the new switch, re-attach the nut, and re-attach the tubing. Once removed, we suggest you replace the switch with one that has stainless steel threads. (The one you removed may have plastic threads as they are less expensive.) To install a plastic thread switch properly with a mass of wires around may prove difficult if not impossible as the threads are prone to cross-threading if it doesn't go in perfectly straight. This will result in a leak, either now or later. A stainless steel pressure switch is easier to install with a little PTFE Tape applied to the threads. In either case, once the new switch is installed, re-attach the two wires and BE SURE TO OPEN THE SERVICE VALVES. Now turn the power back on. With the system running, you must calibrate the switch as previously described. Relays look significantly different depending on the brand of the spa pack. On many packs, the small "ice cube" looking things in the packs are called relays, while the larger, open-circuit counter parts are called contactors. They each do the same thing, allow control over a circuit that cant be controlled directly by the component powering the relay or contactor coil. This could be due to high amperage (such as in a heater) or due to a GFCI protected circuit needing control over a non-GFCI protected circuit. Either way, they each have two things in common, a coil, and a switch or set of large contacts. A relay coil is always identified as terminals A and B on the relay while the switch terminals are numbered. The contactor coil and switch terminals are generally more obvious. The thing to remember is always be sure to replace a relay with one of the same coil voltage and equal or greater contact rating. Check the wiring diagram to be sure the relay you are removing is of the correct coil voltage in the first place. If the contacts of the component are burnt up, it is usually due to problems with the component controlling it such as a chattering pressure switch or thermostat. You will however run into the occasional burnt coil or lightning strike victim. If the relay is mounted with the protective shell facing down, drill a small hole in the bottom of the shell so that condensation cannot collect inside and short out the contacts. Water leaking into the pack can collect and cause this as well. Mechanical thermostats have been used on equipment forever. There are some electronic types available, but they are usually more expensive and therefore not so widely used. Mechanical thermostats are prone to calibration swings due to changes in the temperature around the switch body, capillary tube, and sensing bulb. Electronic types only respond to temperature changes at the bulb, generally the very tip of the bulb. In both cases, a thermostat gives the best performance if the bulb is inside a dry-well (also known as a Thermowell), completely surrounded by the spa water. The next best location is under the insulated cap of a flo-thru manifold. This is only true provided the cap is kept tight and the air around the manifold remains at a somewhat constant temperature. If the air temperature changes, the water temperature will swing too. The colder the air around the manifold, the warmer the spa because that cooler air takes away the heat being transferred to the sensing bulb under the cap. As for calibrating electronic thermostats, it is usually not possible. They must be replaced. They generally have trimpots inside that are very easily broken. A little too much pressure on the screw could create more problems for you. There are many, many different types of Spa Side Controls, and each can have their own specific problems. Here we will consider the most common ones. There are three manufacturers of basically the same 6 pin spa-side control. They are Tridelta, Len Gordon, and Press-Air-Trol. Each will plug into a socket provided on the control box of many models. Which one will be used depends largely on the preference of the spa manufacturer. There are two methods of sensing the temperature with these controls. Some controls still have the mechanical bulb and capillary thermostats in them. Most now have electronic temperature controls (called a Thermistor) available with the spa-side control heads. The mechanical have historically proven to be unpredictable and subject to the same problems as thermostats mounted directly in the equipment packs because that is in fact what they are. Electronic temperature controls are generally more reliable. They employ thermistors in their bulb-like sensing units. These bulbs are shaped just like the mechanical sensing bulbs in order to fit into the same applications. Instead of the fluid used in the mechanical units, the electronic models have wire leads conveying a small electrical current from the thermistor in the sensor. The two controls are otherwise the same with the lights inside working as they always have. Over and above the problems you may have with the mechanical thermostats, the common problem you will occasionally encounter with either control is a faulty harness that they plug into or a bad cord going to the control. In many cases, the spa side control sometimes cause nuisance tripping due to water getting inside the socket on the control box. This normally will occur sometime after installation. When you have trouble with this tripping upon installation, it is often due to a problem inside the cord of the control itself such that one of the light supply leads is touching the ground lead. In order to determine if one of the leads is shorting out against the ground, simply do a continuity test between each terminal and the ground terminal. If any continuity with the ground terminal, you will have trouble. If your Spa Side Control is not like those described above, contact a local spa professional to check it out for you. © Copyright 1994-2019 by PoolAndSpa.com Inc. All rights reserved. 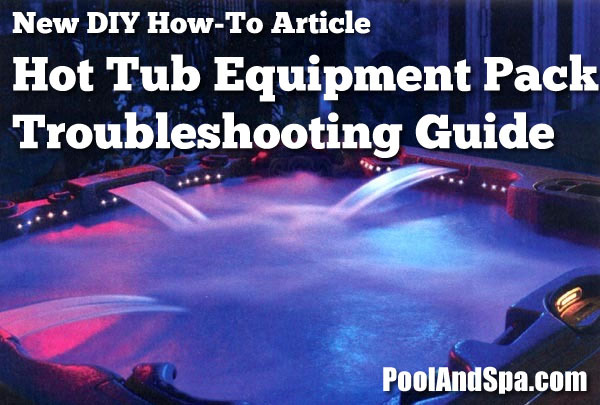 No part of this electronic publication and it's contents may be reproduced, electronically or otherwise, nor distributed in any manner without the prior expressed written consent of PoolAndSpa.com. Any Copyright infringement will be prosecuted to the fullest extent of the law.